Germany had an active day. President Joachim Gauck visited Holland and Kanzler Angela Merkel visited Hollande in Paris. Gauck focussed on the human rights institutions in The Hague, and Merkel discussed the eurozone government, see my former weblog entry. Hopefully they know that full employment is one of the human rights, that is being violated in large parts of Europe. I did my best to help, and dispatched a cable to the German Ambassador in The Hague to call attention to my paper Money as gold versus money as water. After this busy day, my youngest son required bedtime reading and we selected Where the wild things are, by Maurice Sendak. (Dutch Max en de maximonsters.) It seems to be essential reading at that tender age. Surprisingly, my eldest son at college age also insisted on a book and I selected Dichtbij ver van hier, by Tonke Dragt. (English Closeby far from here.) Hopefully you don’t get the wrong idea. We discuss the art of writing. We take a short story and analyse why it is written so well. However, I presume he might be a bit jealous of his little brother who gets a real bedtime read. My liquor store had an offer of two botlles for EUR 18. I took one Puschkin Vodka and one Player’s rum Dark special. Having taken care of the Germans and my sons, I now reside with Art Buchwald and his book Down the Seine and up the Potomac. I have been a foreign exchange student in 1972-73, the Watergate years, and my American Dad sent me this 1977 book that I consider a classic. Ah, that column, where Washington circles try to remember what they talked about before Watergate … ! The Washington Post put a number of Buchwalds columns on the web, see its list. You might appreciate for example his Bush, flipping for Europe. I envy Art Buchwald. He merely wants to comment on society and he merely perfects satire. But I hope that censorship is lifted. This is an entirely different ball game. I hope that the Seine and Potomac take notice, if not the Spree. But, still, I bow humbly to Art, mr Buchwald. Caroline de Gruyter is the NRC Handelsblad correspondent in Brussels. Here is her bio at Presseurop where she gazes dreamily into a far distance. Her acute and informative diagnosis though of last April at Cargenie Europe has the apt title The Dutch Are Trapped In Europe. Caroline crafts a very British understatement here: “that the UK finds a constructive way to stay in the EU”. Given the reports in The Economist about David Cameron’s problems with UKIP and his referendum, it is more likely that the EU has to find a constructive way to handle the UK – including Scottish independence. A EU & USA free trade agreement is less likely when the EU is locked up in recession for the North and depression for the South. Hence I don’t quite agree with Caroline’s otherwise acute analysis. It is very much in Dutch control to lift its censorship of science so that this continent can end its visit to Hades. In NRC Handelsblad last weekend, May 25th, Caroline also wrote about Thomas Wieser and Hans Vijlbrief (a text in Dutch). Thomas Wieser looks a bit like the Ben Bernanke of Europe. The most informative article about him seems to be by Tim Jones in the EuropeanVoice.com, 2009. He now holds the chair of the EU Economic and Financial Committee, say the key policy making committee of the issues discussed in this weblog. Thomas Wieser happens to be born in 1954, like me, Angela Merkel, Franςois Hollande and, not to be forgotten, Alex Salmond of Scottish independence. Caroline compares the diplomatic and effective teamwork of Jean-Claude Juncker and Thomas Wieser with the undiplomatic and increasingly ineffective non-teamwork of Jeroen Dijsselbloem and his treasurer and assistant Hans Vijlbrief. Caroline explains that this is an element in the reasoning that caused Franςois Hollande on May 16 to propose that there will be a permanent Eurozone government, with its own President – and no longer a parttime appointment from a Member State. This is the report from France24 and this is from Reuters. In itself it makes sense. In standard economic analysis, the Eurozone needs integration for the euro to function properly, and then one needs a government with an Executive, Legislative and Judiciary to maintain democracy. The French economy is in dire straits and could very well benefit from such a Eurozone government that starts taxing Germany and subsidizing France. Of course, the UK would be an onlooker only, fall apart, and perhaps be reduced to something like Great Denmark. The situation still causes a small surprise, that however might not be a real surprise since there is a system in the madness. I happened to hear about Hans Vijlbrief for the first time when he wrote a fax in 1995 to the reporters of MUG in Amsterdam. MUG is a monthly magazine for welfare recipients that reports about how to find a job, how to apply for benefits if you don’t succeed, and how to save expenses when on benefit. It is quite popular with a quite large circulation in the Amsterdam region. The name MUG incidently derives from an abbreviation of Dutch Maandblad Uitkerings Gerechtigden, say “Welfare Recipients Monthly”, and should not be confused with the English word mugging, though some readers may of course wonder whether lazy welfare recipients aren’t mugging the welfare state on a grand scale. The actual Dutch pun in its name is that “mug” also means mosquito. At that time MUG received subsidies from the Amsterdam local council and many of its articles carried the stinging message that benefits were too low for a decent living. This is its 2013 website. In 1995 I had good news for MUG’s reporters: there was a new approach in economics that would allow full employment again, provided that the censorship at CPB was resolved. At that time, Vijlbrief worked at the Dutch Ministry of Economic Affairs that supervises CPB. His fax to the reporters explained that CPB functioned fine, that the Ministry also looked at employment, and that they followed a different policy than mine precisely because their approach was better for employment. The final published MUG article can be found here, with my comments in brackets (all in Dutch). My main comment was that I was surprised that Vijlbrief already knew my analysis even though it was being censored. The man must be brilliant, to already know what isn’t available yet. We can observe that Dutch employment policy before and after 1995 is a mess, with a beggar thy neighbour policy of exporting unemployment by means of low wages. It must be with the same ‘burgundian’ optimism and clair voyance that Hans Vijlbrief now conducts the Eurozone policy, managing employment policy that he doesn’t understand, and with a similar command of monetary policy. I am quite tempted to apologize to Thomas Wieser for his incompetence and behaviour. Last year I started my weblog boycottholland.wordpress.com. There is censorship of economic science in Holland since 1990 by the directorate of the Dutch Central Planning Bureau (CPB), under responsibility of the cabinet, now including Jeroen Dijsselbloem, chair of the eurozone group. Like we have “Greek statistics” there is “Dutch economics”. The economic crisis confirms my 1990 analysis but this is neglected too. For the last 23 years, Dutch journalists have been neglecting my protest against this censorship of science. Dutch Ombudsmen in turn neglect my protest against this bad reporting. Last year there were reports about the ONO annual meeting and I sent an email to mr Mollerup, see below. Unfortunately I did not get a reply. Perhaps the problem was that the weblog was still rather empty ? PM. Nowadays my own other website has changed from dataweb.nl to thomascool.eu. This year there were reports by Dutch Ombudsmen Sjoerd de Jong and Margreet Vermeulen about the meeting of 2013. Mr De Jong mentions his meeting of mr Panneerselvan in the bus. Not unlikely, mr Pannerselvan will have a good impression of mr De Jong. Generally people think that Holland is a tolerant and openminded country. However, impressions can deceive. Mr De Jong does not report about misleading and even plain false reports in his newspaper, even though I have called his attention to these. A possible cause is that science journalists do not regard econometrics as a science. A possible cause is that economics journalists think that government officials cannot have a scientific status (as was mine). Overall, there is quite a lot of noise, and one must be prepared to search in the right direction, and start giving the benefit of the doubt to the scientist who reports a case of censorship. One possible cause is that people think that I could submit my analysis to a scientific journal, but then they neglect that the problem needs to be resolved at the Dutch CPB anyway so that there is no reason for me to do such an external submission. The proper process is an internal discussion at CPB, an exercise with the official model, and a publication as a research memorandum by the author; and only then it is upon the external peers to see what they think. An important issue is the position of Paul Krugman, Nobel Prize winner in economics and columnist at the New York Times. It so happens that he will visit Holland in June. I wrote him that his analysis is erroneous on the issues of taxation and the framework of policy co-ordination, and that it was curious that he praised CPB director Coen Teulings who continued the censorship. He can find better analyses in my books DRGTPE and CSBH (see my blog for the full names). My email is here: https://boycottholland.wordpress.com/2013/05/06/email-to-paul-krugman/ Unfortunately I haven’t had a reply and of course a columnist has more freedom than a reporter. However, professor Krugman mixes his column with science and thus one would expect more. I would appreciate it if you would look into this. I intend to include this email in my weblog. Perhaps it could become one of you bulletin entries or “articles about ombudsmen” (…). Some Dutch newspapers have some reports by their ombudsmen about the ONO annual meeting. However, Dutch media do not report about my protest against the censorship of science by the directorate of the Dutch Central Planning Bureau since 1990. In 2004 I started to advise to a boycott of Holland till the issue is resolved. The world is annoyed by the Greek statistics but the censorship of economic science in Holland is much worse. When I inform Dutch ombudsmen about the failure of accurate reporting, they ask some economic journalist about the issue, who probably tells them that I would be some kind of lunatic, and there it stops. This is not a proper way to handle information. Why don’t you call me ? PM. Ms Sullivan is the public editor at The New York Times, mr Mollerup and Dvorkin are at ONO,mr Pritchard is the reader’s editor at The Observer and mr Panneerselvan is the reader’s editor of The Hindu. It so happens that last week had a discussion in Dutch Parliament on frauds with tax credits. As economists we are all aware that the tax credit is an important instrument for employment. We also see that Holland and Germany have a related low wage policy with structural surplusses on the external account that aggravate the problems in the Eurozone. I write to prof. Rick van der Ploeg now at Oxford since he was assistant minister of culture and member of the Dutch kabinet in 1998 when the tax credit was introduced in Holland. In a discussion on the tax credit he stated that I was right theoretically but not practically. Van der Ploeg did not want to clarify this back then. Now that we see mass unemployment not only in Holland but also with the economic crisis all over the world, and now that we see this massive tax credit fraud in Holland, perhaps I can ask again what he means by that phrase. I copy to some other people since the issue is quite important. A key question is whether Jeroen Dijsselbloem understands the issue. It is his Treasury that deliberately lied in 1998 and that would have to make amends now in 2013. It is the common problem in the OECD with the tax void masked by the tax credit that is key to understanding the Great Stagflation since 1970 and to start solving the present economic crisis. Since prof. Krugman stated (a while ago) that he wasn’t quite at home in tax theory, I have written above paper such that it should be understandable for a wider audience. For the context for Dutch readers, I copy below an earlier email in Dutch to prof. Van der Ploeg, parliamentarian Helma Nepperus and the editors of the national television NOS. I might copy another earlier email to Ruud de Mooij, tax specialist now at IMF, but I suppose I already sent enough to read. The boycott of Holland is difficult and counter-intuitive because there are so many attractive features of Holland that you want to enjoy and don’t want to boycott at all. Consider Anouk from The Hague, not far from my Scheveningen residence. Don’t underestimate this Dutch mistress of rock ‘n’ roll. She is a mother of four, creator of twelve albums, receiver of many awards, who still experiments with men, soul, funk and hip hop. Anouk’s latest performance is at the Eurovision Song Contest 2013. She made it into the finals on Saturday May 18 and her success sends waves of euphoria through Holland. One must be a blind and deaf European not to have heard about this annual event. The Song Festival has done more for European integration than the European Union and should have been the actual receiver of the Nobel Prize for Peace. According to the videoclip her song Birds is about a ballerina who is replaced by a competitor and then climbs to a balustrade to jump to her death on the dance floor. A flock of birds outside makes the ballerina smile and she jumps with spread arms as if flying along. A lyric is: “No air, no cry, that’s why birds don’t fly.” I am afraid that I don’t get it. A ballerina may look like a bird but shouldn’t think that she really is a bird ? But birds do fly. Anouk herself plays the choreographer who replaces that ballerina and who triggers the sad events. She maintains a stern face and isn’t singing at all, so we don’t get a clue here either. It seems only wise that she didn’t use the ballerinas and birds in the Eurovision performance but only presented herself in her plain rocker outfit, outclassing all the glitter and glamour of her competitors with her simple black sweater and jeans. Curiously, the Anouk YouTube playlist provides us with two other videoclips that show a flock of birds, the songs Kill and The Good Life. I like Kill better, since here we see Anouk making love to an admirer, and that is a story that an admirer can appreciate. Unfortunately, there is a jealous wife who threatens to kill them … I shouldn’t tell you how this clip ends but the logic is easier to follow and it is a warning to all admirers to keep themselves in check and maintain proper distance to this femme fatale rockstar. The final videoclip Pretending As Always doesn’t show us Anouk herself. It neither has birds, but men dressed as rabbits and behaving like rabbits in the Amsterdam red light district. Apparently there is some reverse psychology with the same message that some men cannot be trusted. Anouk’s tough rock ‘n’ roll image hides a womans heart that longs for a man whom she can trust. I have to be stern and, well, Kill the Dutch euphoria on her chance to win the Song Contest. I have to advise you to boycott Anouk too till the censorship in Holland is lifted. If I wouldn’t advise this, Anouk couldn’t trust my word anymore, and none of us would want that. I react to the idea, mentioned in The Economist, that an independent Scotland might wish a currency union with the remaining UK. That paper discusses the eurozone, but the mechanism would apply to any currency area. I am proposing a new theory – though untested yet – that countries with an Economic Supreme Court could have a currency union without greater political union. Perhaps you would not want to wait till the eurozone gives the working example. A definition of an Economic Supreme Court is in an appendix in my book DRGTPE, see the paper references. The link is that optimal bank capital can be easily attained, if money / capital is created by the Central Bank and directly neutralised by capital requirements. Again, this would help the eurozone, but perhaps the UK can set the example. I happened to see Mr Salmond’s cv and that he was born in 1954. It happens that I was too, like Angela Merkel and Francois Hollande as well. I suggest to take advantage of the common experience of history. It is important to refer to the censorship of science since 1990 in Holland and my advice to boycott Holland till that censorship is lifted. Perhaps your best point to start reading is this weblog entry where I observe that Spain might block EU membership of Scotland for fear of a precedence on Catalunya. But Spain might be grateful if you help solve the EU crisis by boycotting Holland till the censorship of economic science is lifted. Holland’s main objective before and possibly during World War 2 was to be neutral. This attitude had had some success in World War 1 in 1914-1918 though towards the end there were rising frictions about trade and the use of Rotterdam as a harbour for Germany. The attitude failed in World War 2 in 1939-1945 when (the center but not the harbour of) Rotterdam got bombed and the country occupied. Still, resistance against the occupation was exceptional. The war was essentially a period of cognitive dissonance, during which the Dutch longed to be neutral and tried to neglect reality as much as possible. The public image of Holland in the allied countries of the USA, Canada and the UK became that Holland was part of the alliance, with Queen Wilhelmina broadcasting from London and with the oil refineries on Curaçao providing most of the kerosine for airplanes. In reality Holland was rather a lame member of the Third Reich and waited for the nightmare to go away. Ies Vuijsje started the Dutch Historikerstreit of he himself against all others, about how much the Dutch did know about the holocaust – or the Nazi “final solution” for the jewish population. He holds that it is a myth that the Dutch did not know that the Jews would be killed who were transported out of the country. He emphasises that who wanted to know had ample means to get to know the truth. The Allies gave a general declaration on December 17 1942, signed by the Dutch government in London, and broadcasted by the BCC and Radio Orange, that the Nazi’s were exterminating the Jews. Ed van Thijn, a Jewish survivor of the war and later Mayor of Amsterdam in 1983-1994, reviewed Ies Vuijsjes book of 2006, and stated that the silence of Dutch historians made him suspicious that Vuijsje was right. The Radio Orange broadcast in 1942 was read by Lou de Jong (1914-2005), who later became the chief War Historian and director of the NIOD, the Dutch historical instute on World War 2. Van Thijn records that De Jong refers to the Autumn of 1943 when most of the Jews had already been deported. De Jong championed the theory in his scientific writings that the Dutch population was aware of transports, supposedly to camps to work and such, but not of the intended murder. Vuijsje’s tentative theory is that De Jong suffered from cognitive dissonance. De Jong was Jewish himself and though he apparently admitted later, in his personal memoirs, that more could have been done (see Noordervliet), it must have been difficult in his scientific analysis to acknowledge reality and his own failure. The following graph gives the number of Jews per 1000 inhabitants per country in 1940, on the horizontal axis, and the % killed of those at the end in 1945, on the vertical axis. The red dot is the overall average, with a total 1940 population of 431 million and 8.9 miljoen Jews, thus 20.6 per 1000, and 5,9 miljoen Jews killed, or 67%. The green dot is Holland, with a 1940 population of 8.9 million, 140,000 Jews, or 15.8 per 1000, and 105,000 killed, or 75%. 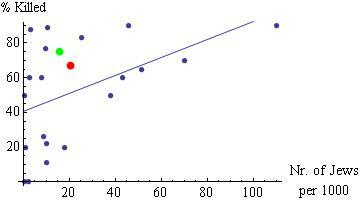 The regression line is y = 41 + 0.52 x. An average country starts out with murdering 40%, and of each two Jews per 1000 an additional one of those is killed. Tolerant and freedom loving Holland belongs to the more deathly nations, where Anne Frank can be betrayed and put on transport with everyone watching lamely and telling himself or herself that one cannot do anything about it. A book of 2012 is by Bart van der Boom of Leiden who studied 164 diaries and who suggests that people were abhorred by the deportations but were generally unaware of the intended murder. His good point is that the notion of a gas chamber is a horror that was less imaginable before 1945. Blogger Arie Kok accuses Ies Vuijsje of slandering Lou de Jong. May 5th is Liberation Day in Holland and Vuijsje was allowed to fill two pages of NRC Handelsblad to make his case again (May 4 2013, Opinie & Debat page 8-9). A gas chamber by way of method is not much of an argument when the subject is intended murder itself. This got a reply from Bart van der Boom on his weblog, who argues that Ies Vuijsje neglects the proper arguments. The “Wir haben es nicht gewuszt.” applies to the Germans who operated the concentration camps and not the general German population and the Dutch who sent in the Jews. It is important to observe that Germany has spend and still spends much time and effort in schools and on television to deal with the national trauma of having been Nazi’s and having caused the wars and the killings. Holland hasn’t done its share on its lame role. The Dutch mentality is cognitive dissonance. The data are from here, while 1940 population data come from Wolfram Alpha.